At morning it was rainy and windy weather. It checked quality of our tents and an outdoor equipment. Well chosen place for tent was very important. Some of tents stayed in the water. Also the wind didn’t help our tents so much. But I had good luck and my tent resisted. Concerning to weather we declined to go on some trip. We didn’t want to get wet. We decided to pack Boris’s tent, because it wasn’t suitable neither as store. Without going on trip it wasn’t there so much possibilities how to spend free time. After founding stream with thermal water near of our camp, we decided to try it. 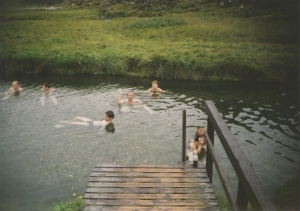 When it a little bit stopped to rain we wore swimming suits and over them our Gore-tex jackets and went to swim. Jackets we left over on tentative hangers on bank of stream and divided into thermal water. It was excellent feeling. Outside it was temperature some degrees above zero, it was a little raining and we were dipped into hot water. When it started seriously raining some of us gave it up. In short time I must gave it up also, because rain started to be very strong, and my jacket on the bank was going to be wet. I left water, took my jacket into hand and ran to my tent in the strong cold rain. When I came into tent I was wet and cold. I changed my swimming suit to dry and warm clothes. It took me some time, but when I was dressed, I started to relax. When the weather improved, we decided to prepare our rice from previous day. Educated from yesterday, we cooked our rice in small wooden cabin, near of our bus. Later we recognized that it was service cabin for neighbouring toilet. Our rice was cooked in background sound effects from toilet. Three times boiled rice with meat wasn’t so good, but it was warm, and we ate it together from one big pot. 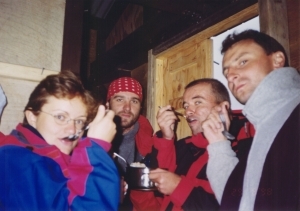 We had been overeaten, when joined us Lubica from Presov and she helped us. At last we prepared also hot tea. It was still raining and we went to our tents, where we played cards. It was only one thing, what it was possible to do there in this weather.